While planning for Under the Seapalooza, I was trying to come up with some fun ideas for things to and asked for input. Nikki Jefford (author of Entangled and the awesome guest post & giveaway, which you should check out: here) came up with the idea for weekly “Show & Tell” memes. Unlike ongoing meme’s, this one is temporary – every Thursday throughout the month of Under the Seapalooza. Each week, I’ll show off my favorite something (this week it’s bookmarks), then you show off your favorite thing and enter to win a prize. My nook skin is called “Coffee Angel” by Caia Koopman. 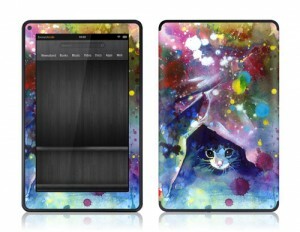 My Kindle Fire skin is called “Meow” by Lora Zombie. So what about you? 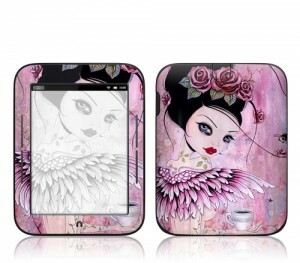 Do you have a skin for your eReader? If you don’t have an eReader, do you have covers for you cell phone or laptop? If you’re like me and love decorating your electronics, then you’re in luck. Because I’m giving away a $50 Gift Certificate to Gelaskins. What’s awesome about them is they have skins for phones, laptops, eReaders, iPads, gaming, etc. You can design your own skin, or even order prints from their artists. So even if you don’t have an eReader right now, you should definitely enter the giveaway. All Show & Tell Giveaways will run until August 25th. It’s open to the US & Canada only, sorry. Thanks again to Nikki Jefford for coming up with such a fun idea! Every person use skin cover to maintain their high-maintenance device from any sort of damage that usually arises during usage. One can search online for choosing skin cover according to their choice. I have a perry the platypus skin for my i pod touch! I love the Caia Koopman skin for Nook! Ooo! Pretty skins! I’ve been eyeing them for my Nook and laptop, but haven’t gotten one. Thanks for sharing that site, though, for me to browse. Unfortunately, I don’t have an ereader skin. My Kindle Fire is plain as plain can be. I have a nook color, and it has a boring purple case on it. Would love to get something more colorful for it. Thanks for the link to GelaSkins! They look awesome, and I needed a new case for my phone. I recently gave my nook away to my mother, because I got an iPad. But I would love to get some skin on my iPad. I have a cool cassette tape gelaskin on my iPhone, love it! I don’t have a skin for my ereader yet but would love to win one! Thanks! I don’t have a skin on mine, but I bought a nice cover for my Fire. It’s a really pretty red and looks like an old fashioned leather bound book. I love it!